It didn’t look good for catching a glimpse of the eclipse yesterday. A thick layer of clouds covered our region almost until the moment the eclipsing started, when they miraculously cooperated, retreating from the Western sky until the setting of the partially occluded sun. Those of us who remained hopeful enough to be at the ready with our eclipse viewing glasses were rewarded by a lovely sunset with a difference: a neat scoop removed from the sun’s orange disk on its Northern side. The 23 October solar eclipse. Credit: ©Lee Phillips. The photograph, taken from McLean, Virginia, shows the initial hint of an occlusion. 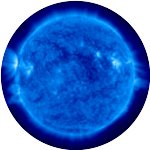 It is more easily seen in the ghost image of the sun rather than the direct image. 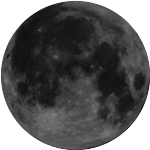 We were able to see the moon’s shadow increase a bit before the sun became obscured by the trees. 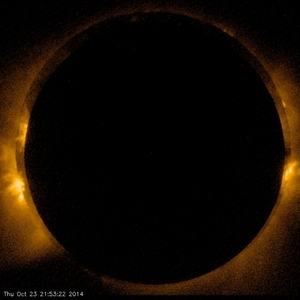 23 Oct 2014 eclipse from Hinode spacecraft. Credit: NASA/JAXA/SAO. Here is another view of the eclipse. How is this possible? This is a picture of an annular eclipse, but yesterday’s event appeared as a partial eclipse wherever it could be seen from the Earth. The answer is that this photograph was taken not from the surface of the Earth, but from the Hinode spacecraft. The next solar eclipse visible from the United States will occur August 21, 2017. Get ready now!